Mainstream Muslims in the West typically deny the religious dimension of jihadism rather than condemning it. On Nov. 12 -- the day before the Paris terrorist attacks -- two ISIS suicide bombers blew themselves up in Beirut, killing 43 people, mostly Shia Muslims. It was the worst terrorist attack in Beirut since the end of the Lebanese civil war. One would have expected outrage among the Islamic communities of the world. However, the blast barely made a ripple in the robust Islamic social media community. If Islamic leaders and clerics were outraged by the ISIS atrocity, it was not reflected in any significant manner on Twitter and other social media. This would change dramatically the following day, when ISIS struck again in a multi-pronged attack on Paris for being "the capital of sin" in the words of Islamic State. In all, 129 people died in what the French prime minister labelled an act of war. As ordinary citizens to prime ministers and presidents around the world reacted in horror, Islamic leaders suddenly remembered the Beirut tragedy. The significance of an attack on a NATO country by ISIS was not lost on the Islamists. As the glare of public scrutiny caught them, they hurried to equate the Paris attacks to the Beirut bombing and started venting contrived anger that the media had not given fair coverage to the Lebanon disaster, compared to France. The #TerrorismHasNoReligion hashtag trivializes the Paris attacks. Muslims who had not uttered a word about Beirut were now tweeting their anger about Beirut receiving less importance than Paris. Of course, this wasn't true. The western media covered the Beirut blast extensively. As the website Vox.com reported, the New York Times, the Washington Post, the Economist, and many other media covered the Beirut bombings, while CNN aired one segment after another on it. Within 24 hours, the hashtag #TerrorismHasNoReligion was trending worldwide as Islamists jumped on the victimhood bandwagon in a bid to trivialize the Paris attack. Their argument seemed to be that because Muslim on Muslim terror was the order of the day across the Islamic world, westerners should not express grief if Muslims attack the West. It wasn't just Islamists who were pushing the point that the Paris attack had nothing to do with Islam. The former prime minister of Slovenia told the India Ideas conclave in the picturesque Indian city of Goa that, the "Paris attack had nothing to do with religion." 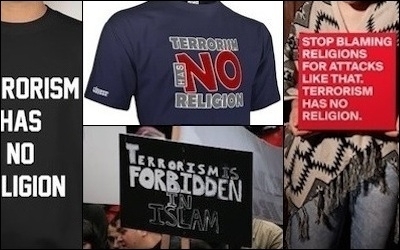 In Toronto, Islamists and their leftist allies protested with placards saying, "Terrorism has no Religion". Of course "terrorism has no religion," but the terrorists do have a religion and almost invariably that religion is Islam. Of course not all 1.2 billion Muslims are terrorists or even Islamists, but enough are. What more Muslims need to do is openly denounce the Islamic doctrine of armed jihad, and renounce the application of Sharia in public law. But they won't. I read the cliché-ridden statements by imams and Muslim academics, but no one dared to denounce "armed jihad". They could do more. Islamic clerics should stop praying for a Muslim victory over Christians, Jews, Hindus and atheists that takes place in mosques around the world. Of course they dare not. We have a choice today. Fight and destroy ISIS and vigorously condemn the Islamist political agenda, or be ready to die as innocent Parisians did last week. Terrorism may not have a religion, but most terrorists certainly have one, and that religion is typically Islam.